TMJ Syndrome—Jaw Pain and Clicking is Not Normal. Have you ever woken up with a sore jaw? How about a headache that doesn’t respond to Tylenol, massage or chiropractic? Do you ever hear clicking when you chew? Or maybe your teeth are wearing away, getting crooked, chipping or even cracking. If you are experiencing any of these symptoms, it is very likely that you are suffering from TMJ syndrome. TMJ syndrome is an acute or chronic condition affecting thetemporomandibular joint (TMJ), or joints of the jaw. 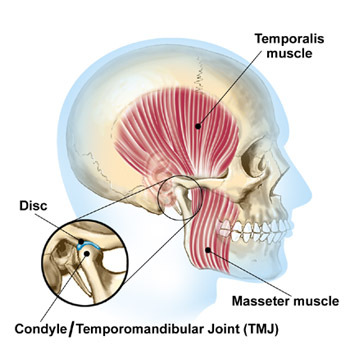 TMJ syndrome is also referred to as temporomandibular joint disorder (TMD). Currently an estimated 10 million people in the United States suffer from TMJ syndrome, with 25% of the population suffering from symptoms at some time in their lives. Although women suffer from this disorder four times more than men do, nearly two million men are afflicted with jaw pain, making it one of the most common disorders I see in my Los Angeles, Beverly Hills, and West Hollywood chiropractic practice. Because of the multifactorial nature of this disorder, comanagement between a chiropractor and a dentist may be necessary. 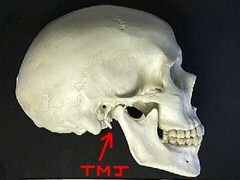 The TMJ is a joint that connects themandible (jaw) to the temporal bone of the skull. It moves in three different directions. It acts as a hinge, allowing opening and closing of the mouth, and it also moves forward and backward, as in jutting the jaw, known as protrusion and retrusion respectively, and from side to side. The jaw joint is used in many different activities including chewing, talking, and yawning. Because of the frequency in which the jaw joint is used, TMJ syndrome can be extremely disruptive. 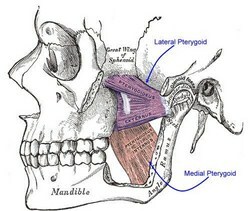 The TMJ can be found just forward to and below the ears. If you place your fingers in this area and open and close your mouth, you can feel the joint moving. Rubbing in this area can be very painful in people suffering from TMJ syndrome. The TMJ is controlled by three muscles—the temporalis, the masseters, and inside the mouth, the medial and lateralpterygoids. These muscles are also known as the muscles of mastication or chewing muscles. Together they provide the greatest force per surface area of all human movements. The TMJ has a distinction of being one of the few that is both synovial (freely moving) and containing a disk. It is controlled by cranial nerve V, but runs along the same pathways as several nerves of the neck, so TMJ syndrome can also cause neck pain and vice versa. You will first receive a full workup including an evaluation of your spine and muscles surrounding the neck. You will have your jaw and bite evaluated. Once TMJ syndrome is determined, you will have all your subluxations adjusted. You will have your neck muscles massaged, stretched and evaluated for weakness. If muscular weakness is evident, you will receive exercises to correct it. Your posture will also be evaluated and corrected if necessary. Then we go into the jaw. Once the pterygoid muscles are relaxed, the jaw regains an incredible amount of movement. The jaw becomes lighter and pain subsides significantly. Popping and clicking reduce immediately, and can be completely eliminated over a few sessions. This treatment protocol gets results: In my Los Angeles, Beverly Hills, and West Hollywood chiropractic clinic, I treat hundreds of people for this disorder every year. Not only do they feel better immediately, the results are lasting, and ultimately it saves money. The alternatives are less safe, less effective, and include surgery or doing nothing. Surgery has varied results, and doing nothing ultimately costs more in fixing cracked teeth, crowns and sometimes braces. Getting treated by a chiropractor is a great, conservative approach, much better than the other two options. Preventing TMJ syndrome requires a few lifestyle corrections. The first is kicking the gum chewing habit. That’s right—not chewing gum in many cases clears TMJ syndrome right up. I once had a lady bring in her 13-year-old daughter who had jaw pain, a little young for the development of TMJ syndrome. After questioning the girl, I found that she had quite the gum chewing habit. I told her to stop for one week, and once she did, her jaw pain went away. Bingo! Chewing hard objects, cracking nut shells or sunflower seeds, or opening beer bottles with the teeth can also lead to TMJ syndrome. Discontinuing these activities also does wonders in alleviating jaw pain. But by far the most common cause of TMJ syndrome is the clenching of one’s teeth unconsciously. As I mentioned earlier, clenching the jaw is known as bruxism. It usually occurs without the clencher being aware of it, most often at night during sleep. Take it from a jaw clencher, this dysfunction can cause many problems in the mouth. I find that clenchers tend to be people that deal with a lot of stress. This is not a hard, fast rule, but it has been my observation. Clenchers release stress as they sleep, and the most effective way to do this, the body has found, is to clench the teeth. 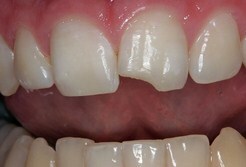 Teeth clenching can lead to chipped teeth, cracked teeth, crooked teeth, and jaw pain. The answer to this is two-fold. First and foremost, having outlet with which to release stress are very helpful:Yoga, meditation, exercise, punching a heavy bag all do wonders to release stress. But sometimes not even these measures do the trick. If you find that you’ve tried all the above stress relieving activities and you still clench, then you might have to visit your dentist for a night guard or splint. 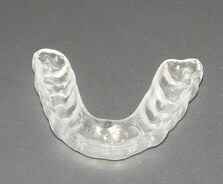 Night guards are customized plastic splints that are worn over the teeth as one sleeps. The guard prevents the jaw from fully contracting and not only saves the teeth, but relaxes the jaw in the process. I’ve been wearing a night guard for years now and it has saved me from much pain and anguish. If you have not investigated this option, I highly recommend it; and if you live in Los Angeles, Beverly Hills, or West Hollywood, I know a great dentist who will fit you for a night guard at a reasonable price. TMJ syndrome is a common disorder that causes pain and dysfunction, and could end up costing you lots of money over the years. There is an answer: Safe, effective chiropractic care can do wonders in reducing jaw pain, eliminating clicking and popping of the jaw, and save your teeth from painful, costly wear and tear that can lead to tooth loss over time. If you want proven results, want to save money, and discover a great way to preserve your health, visit your local chiropractor today.